Hello Everybody! This is Karina. It’s getting really cold outside and that means that my favorite holiday is coming! It's a New Year. 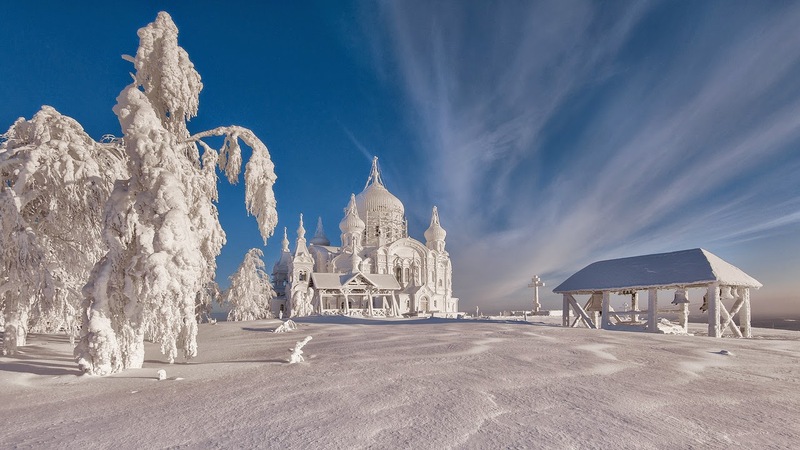 I find it very interesting, that unlike many other countries, where Christmas is much more important than New Year as a holiday, both Russia and Japan put New Year on the first place. Russians have a great tradition of celebrating it - they all get together and make lots of food, than they drink sparkling wine and watch New Year's TV programs the whole night. On 31st of December everybody is waiting for the midnight - to have a big dinner, play in the snow and watch the fireworks. For me, New Year always brings back the best memories from the childhood. It is a white snow on the ground and a blue ice on the lakes, it's a smell of oranges and homemade gingerbread, it's colorful lights everywhere on the streets, it's a cozy warm blanket and hot chocolate, it's all my favorite Christmas Movies ("Home Alone" never gets old! :) , it's fireworks and presents under the Christmas tree. 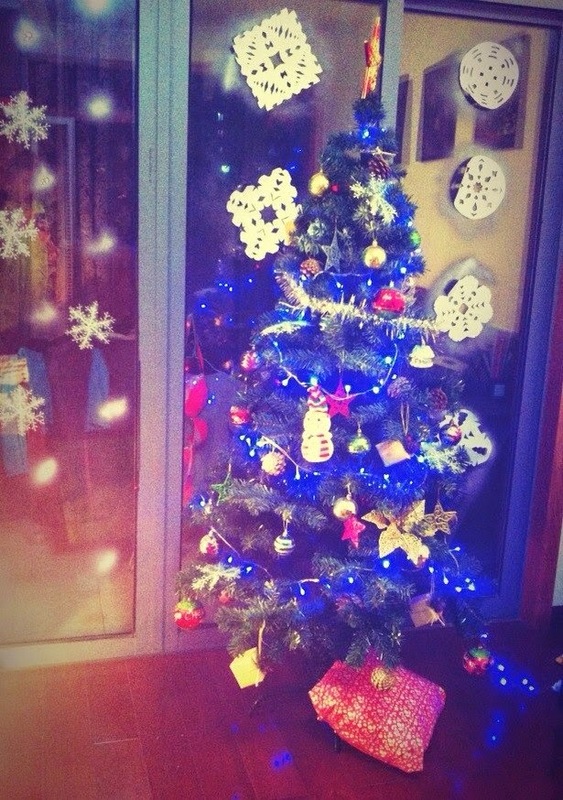 Our Christmas tree last year. In addition, I want to share one of my favorite recipes with you. 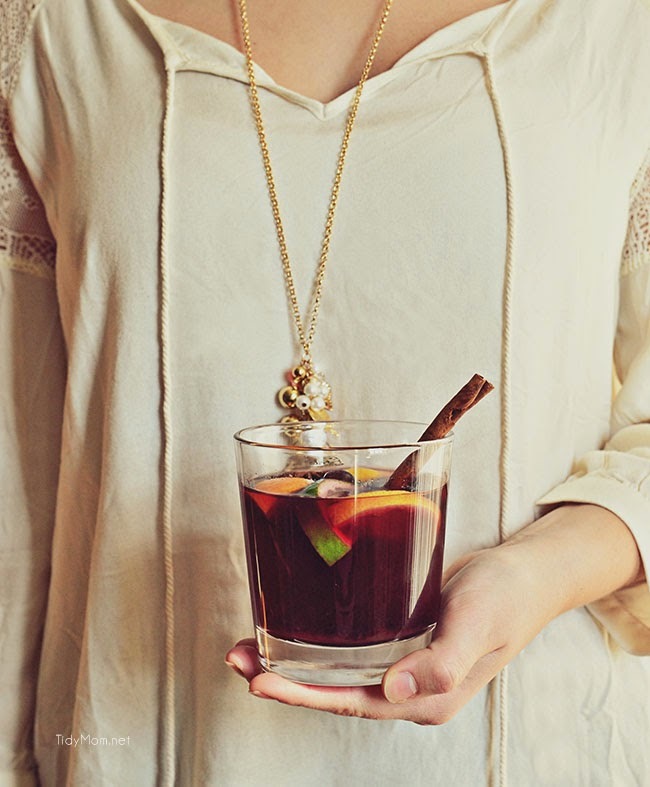 It’s called “Mulled wine”, which is a hot wine with spices and fruits. It’s popular all over the world now, but the origins of this drink come from Germany, where it’s called “Gluhwein”. Pill the orange and cut it into 4 pieces. Cut the apple into small cubes. Combine wine, sugar, spices, orange pills and apple cubes into the pot, than squeeze the orange into that mix. Turn the heat on and keep heating for about 10 minutes, making sure it doesn't come to a boil and stirring occasionally to make sure the honey dissolves. When the wine is steaming and the ingredients have been well blended it is ready to serve. Mulled wine can be left on the stove to heat for many hours. It can also be stored in the fridge and reheated the next day. I hope you enjoy your holidays as much as you can! I wish you all the best and… I see you next year! The Summer is finally over and the temperature is cooling. It is 18 degrees in my hometown now and 28 degrees here. Let's look at the U.K. in Autumn. The leaves change colour of course. On a traditional English home it looks beautiful! 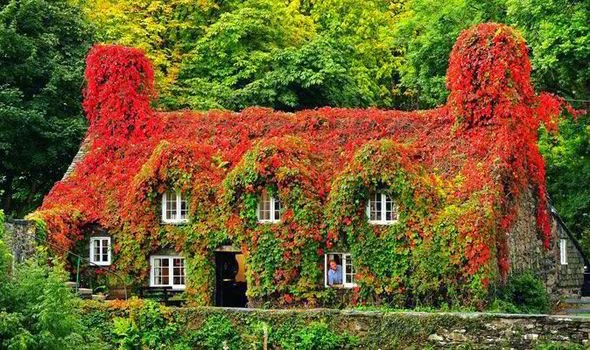 This is a thatched cottage covered in ivy. 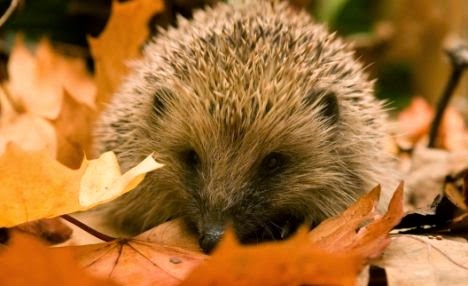 During autumn, animals that hybernate come out to look for food to last them through winter. It wakes up sometimes to have a snack but will sleep from the end of Autumn until Spring. We have many festivals in the U.K. over Autumn. You all know about Halloween. It is thought that Halloween comes from a Celtic festival for the dead. Collecting candy by saying "Trick or Treat" is an American tradition. In the U.K. we are more likely to lock the door and tell ghost stories to each other in the dark. 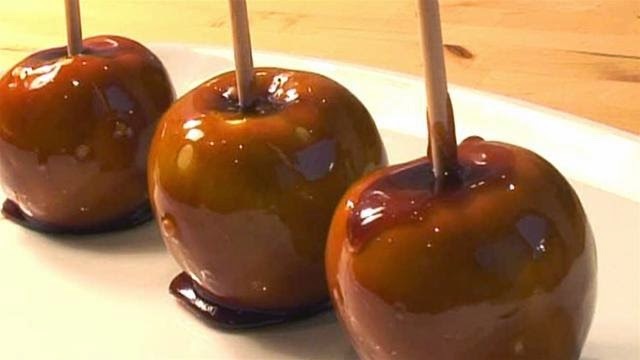 We do have toffee apples but they are apples covered in toffee not candy. They are sticky and the toffee doesn't fall off as you bite it! This is a very traditional Autum food in The U.K. 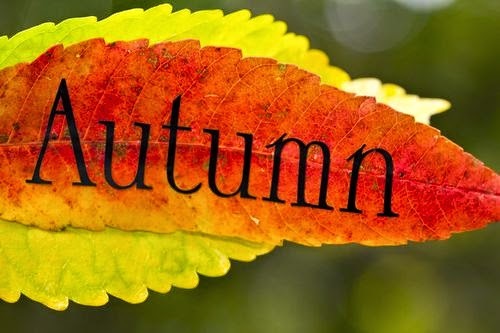 I hope you stay warm over autumn and enjoy it as much as I do! 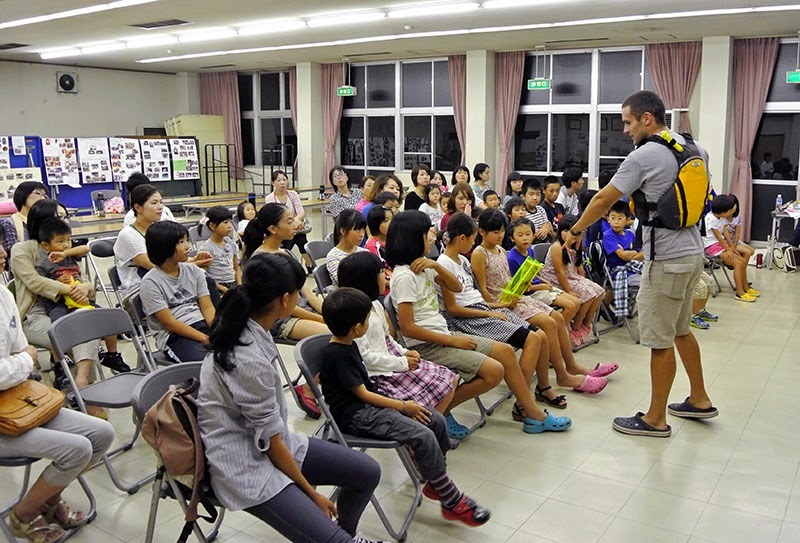 Last weekend I did a presentation about the Japan to Korea kayak expedition with Koji, the expedition leader. We were able to talk about all of the beach cleanings we did. Also, I showed the children some trash art that I had made which was trash from Tsunoshima beach in a yellow plastic box. I wanted to children to know that it is very important to clean the beaches. 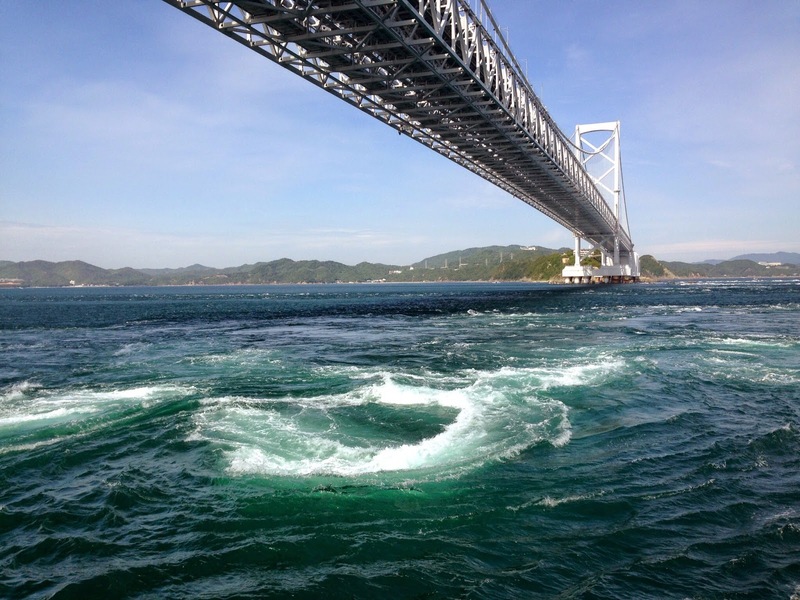 I'm looking forward to next weekend because I will be doing a beach cleanup of Tsunoshima. We are joining the Tsunoshima community. Maybe 200 people will come to the beach cleanup. I will post come pictures on the blog after the cleanup. Have a good weekend. 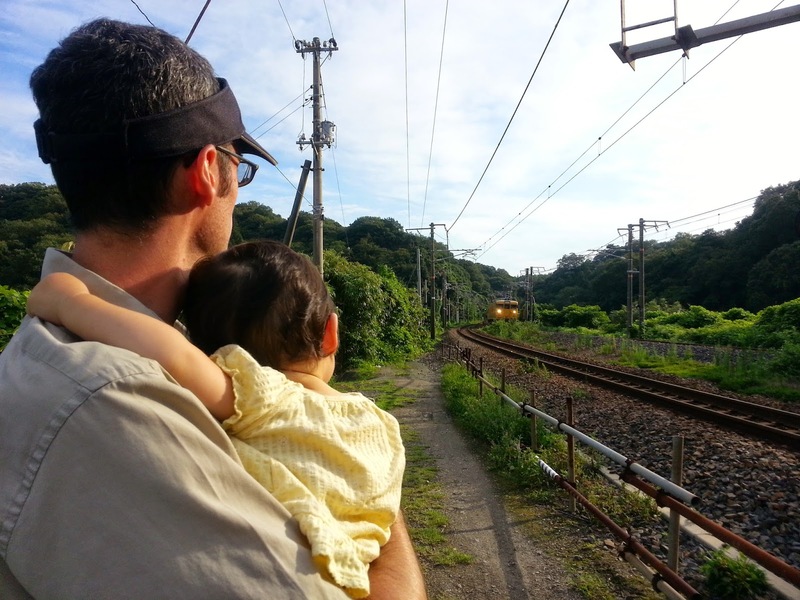 Do you ever take the train between Hofu and Tokuyama? 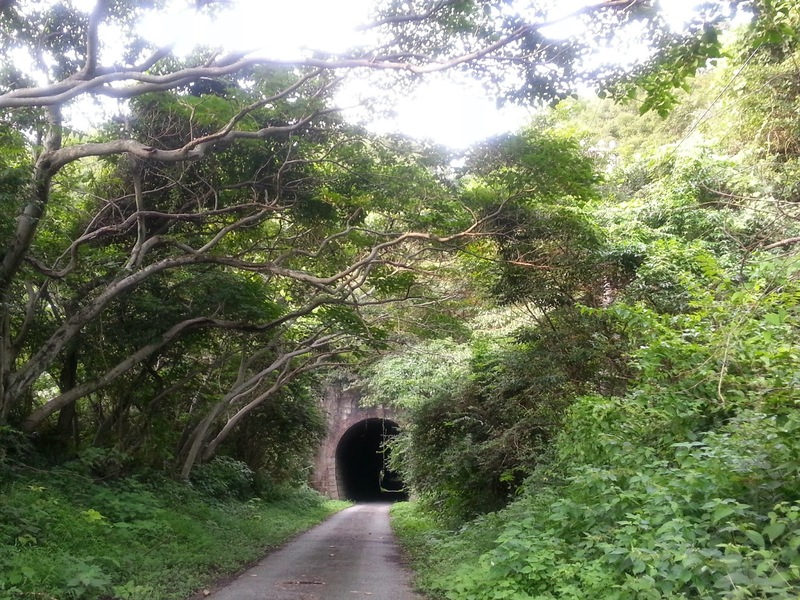 If so, you know that the stretch between Tonomi and Heta is quite beautiful. The tracks here hug the coast, providing wonderful views of the ocean to the south and of mountains covered with wild forest to the north. The view here is worth the price of the ticket! But I always wonder about this stretch between Tonomi and Heta: Where is it, and how do I get there? Recently, my wife and daughter and I tried to find out. 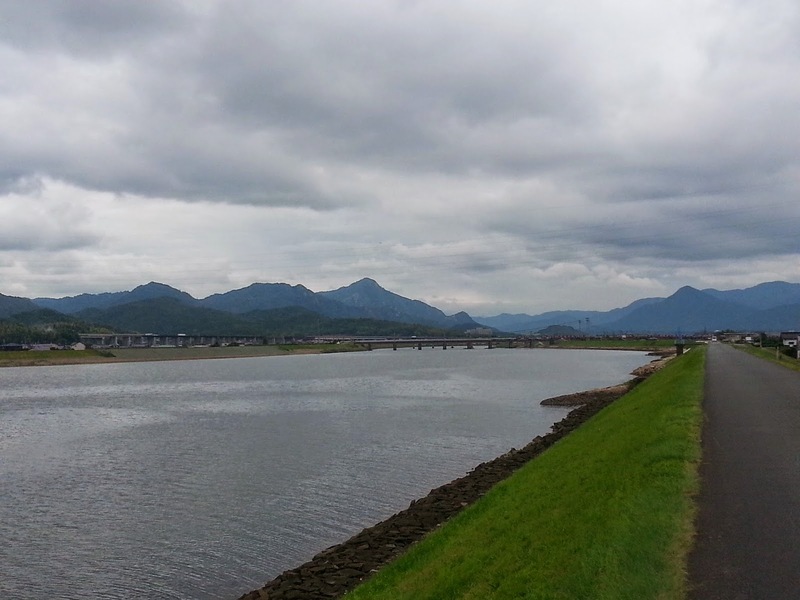 After eating some delicious soft serve ice cream at Soleine michi no eki, we turned off Route 2 onto a small road and headed towards the mountains. We went through two tunnels beneath the expressway and then up and over a mountain pass. 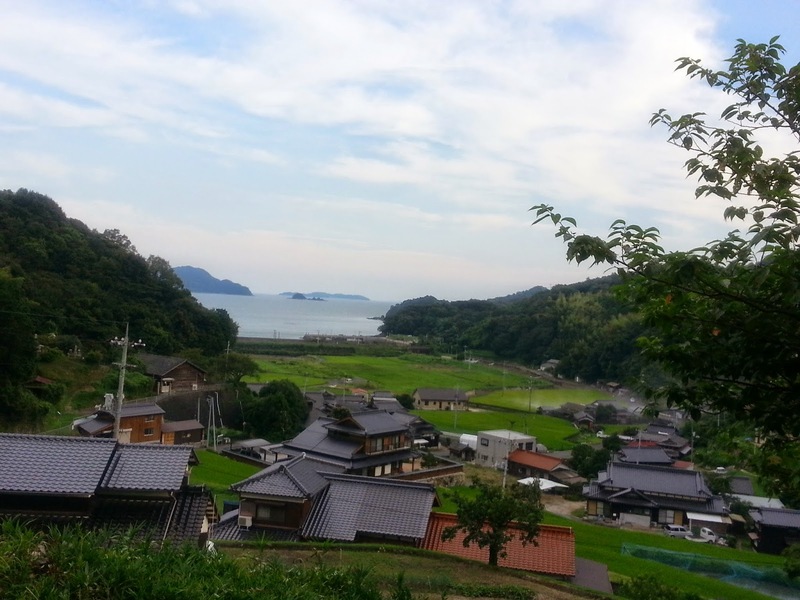 On the other side, we found the little town of Shirodani sitting quietly next to the sea. We drove through Shirodani, feeling like we were far, far away from Hofu and Tokuyama, somewhere deep in the mountains, maybe even back in time. It was very peaceful there. Continuing through the village, we found a little road and decided to follow it through an old, dark tunnel. After bumping through the dark, wet tunnel, we emerged to find the sea and forest and mountains and nothing else other than train tracks. The sea here was very beautiful. Two men in boats were collecting oysters, but they were the only people around. After a few minutes enjoying the view, we heard the sound of a train approaching. Sure enough, it was the yellow train that goes between Hofu and Tokuyama. So this was indeed the spot I had seen from the train. We had found it! We stayed here for a little while enjoying the peace and quiet. We walked down to the sea, and my daughter and I walked into the water a few meters, looked at colorful old shells on the sea floor and watched fish jump into the air. 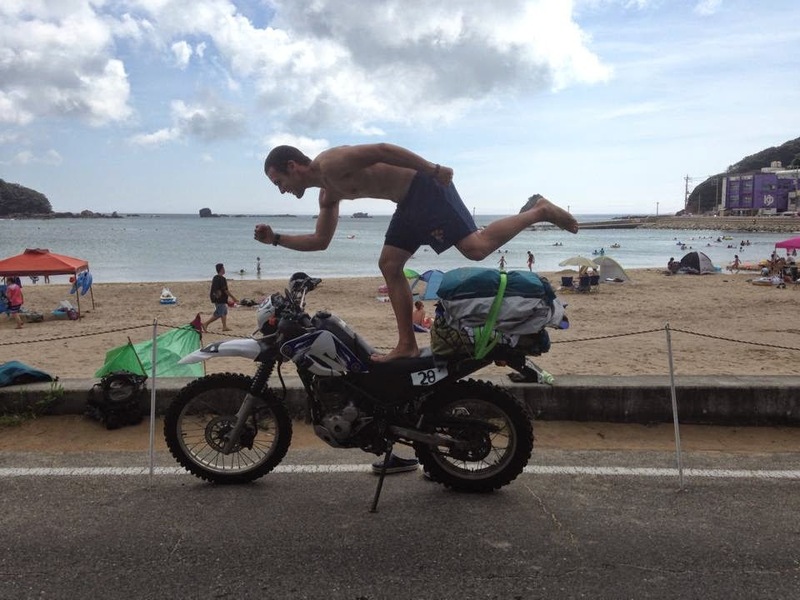 Its Mike and for my Obon vacation I went on a 2,100 Kilometer motorcycle tour from Shunan to Tokyo and back. 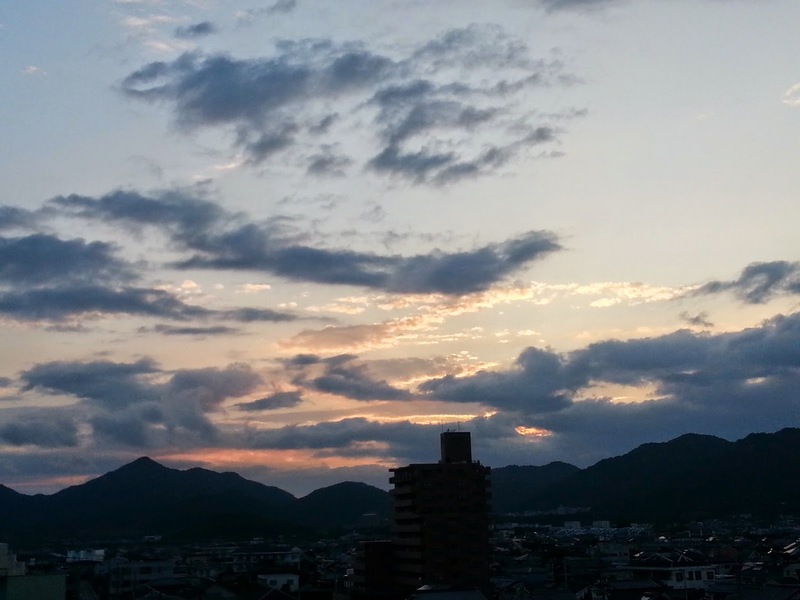 I left Shunan on the night of August 8th and rode my motorcycle for 20 hours. I arrived in Tokyo on Saturday evening. Also, I climbed Mt. Fuji. 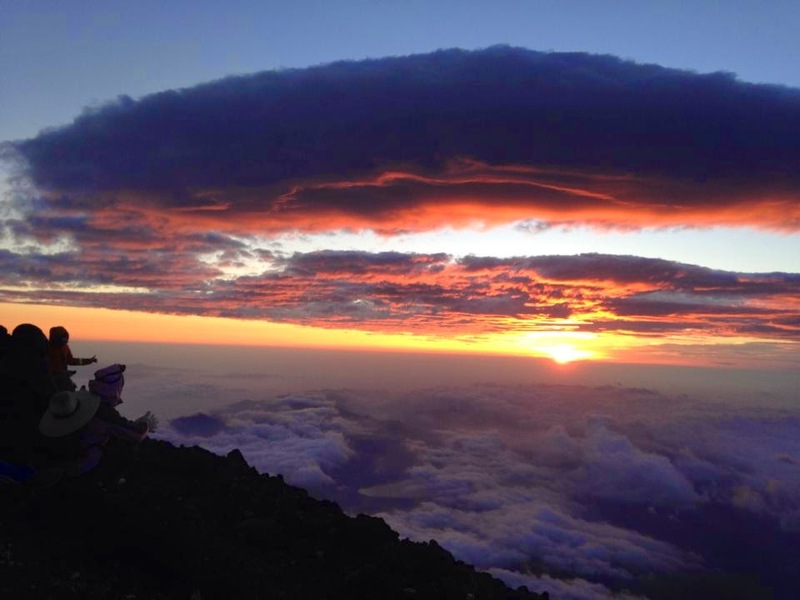 I started at 7:00pm and climbed all night until I reached the top for sunrise. The view was amazing. 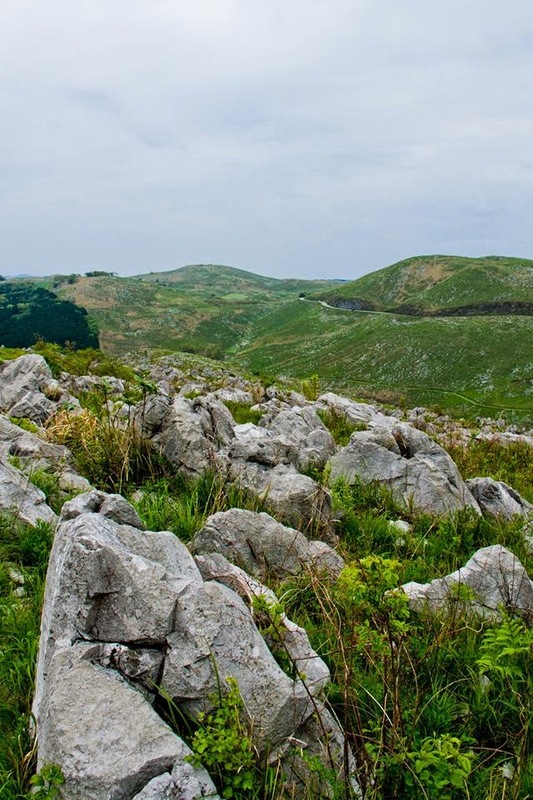 Have you ever climbed Mt. Fuji? Also, I went to Shimoda Beach. I went snorkeling and enjoyed swimming in the warm water. At night we slept in a tent on the beach. I LOVE ADVENTURE !!! and download the exercise document. It is a pronunciation exercise for /r/ and /l/. Second, listen to me pronounce the words in Column 1 and 2 a few times. After you Listen to "Pronunciation (Reading Column 1 and 2)" a few times listen to the track below. I will select words from Column 1 or 2 and read them. Try to guess which words I am reading. Also practice reading the words yourself. I had a very busy, but very fun Obon vacation. 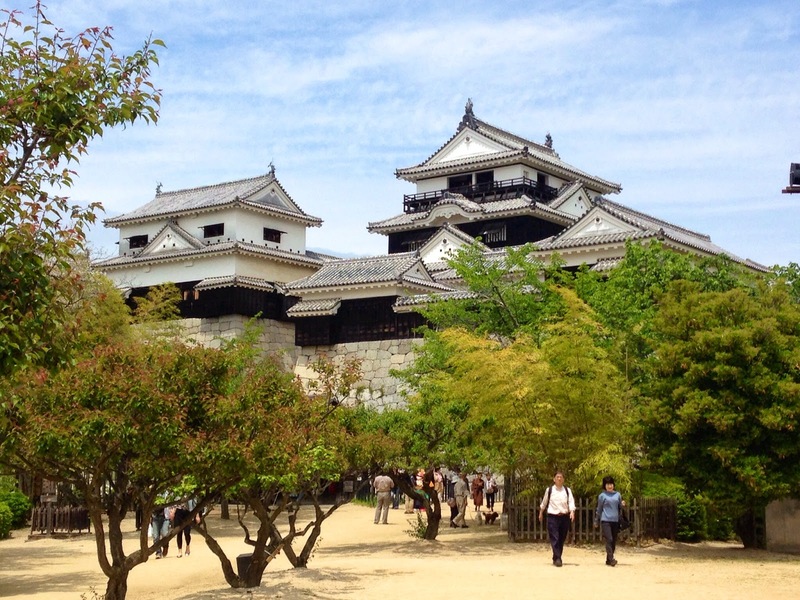 I drove to Okayama, Himeji, and Kobe. 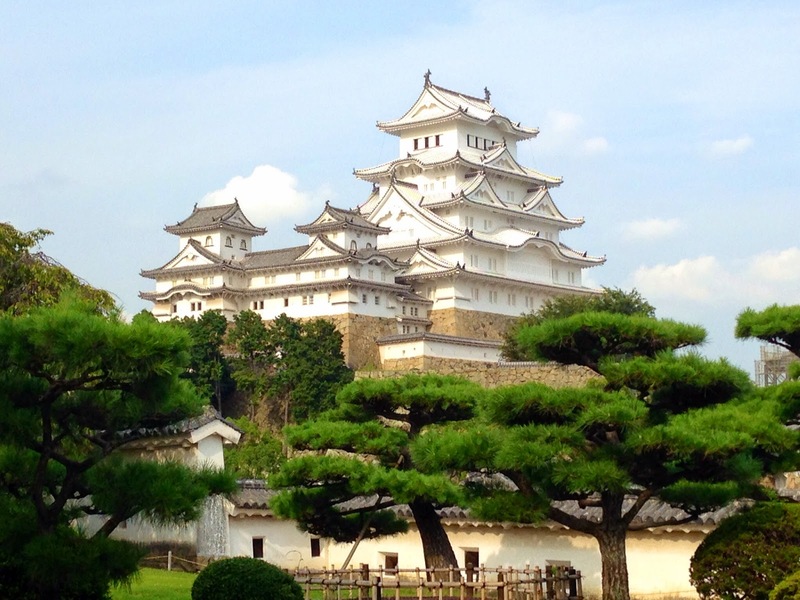 I heard that Himeji Castle has been under construction for a long time, but luckily they recently took off the scaffolding so I was able to get some good pictures. I really enjoyed Kobe! It's one of my favorite cities I have visited so far. 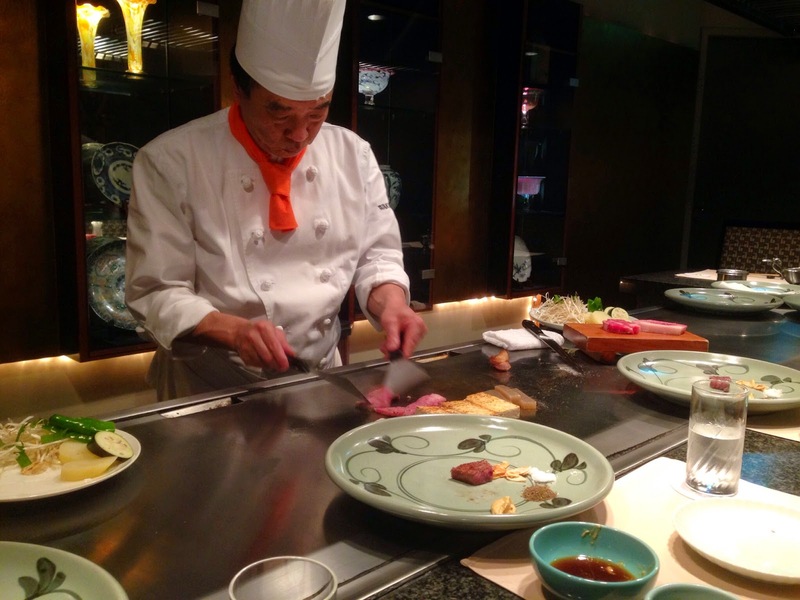 I splurged on a nice lunch of Kobe beef that the chef cooked in front of me. It was very delicious :) I also found out that Kobe has a panda at their zoo, and pandas are my favorite animal! 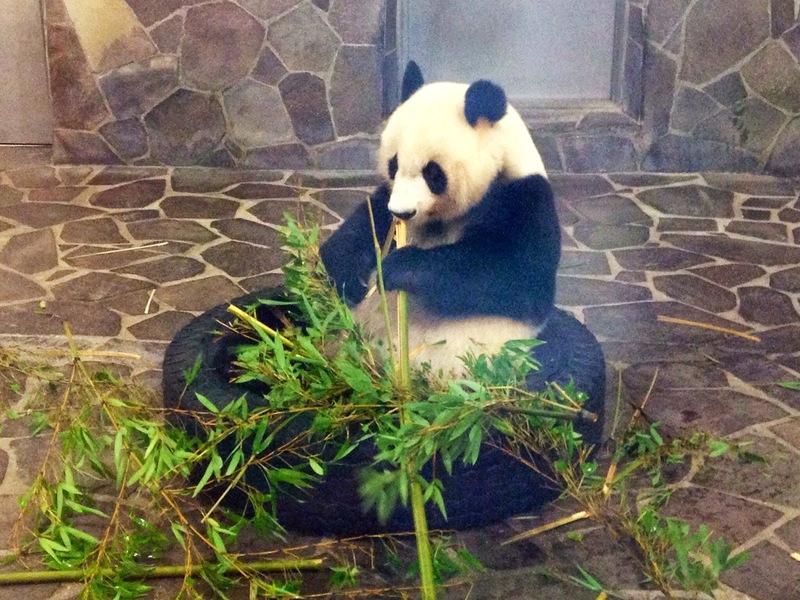 I was lucky enough to see the panda eat and do a little walking around. I hope you had a wonderful vacation! Hello everyone, this is Shauna. 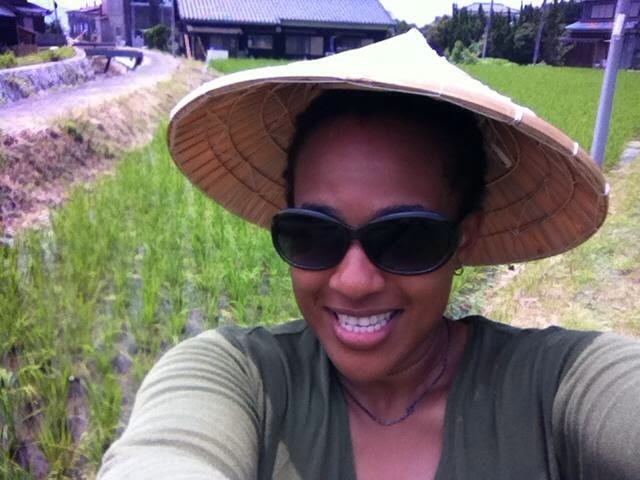 Last weekend I went to pick weeds in an organic rice field with Mike. Have you ever picked weeds in a rice field? 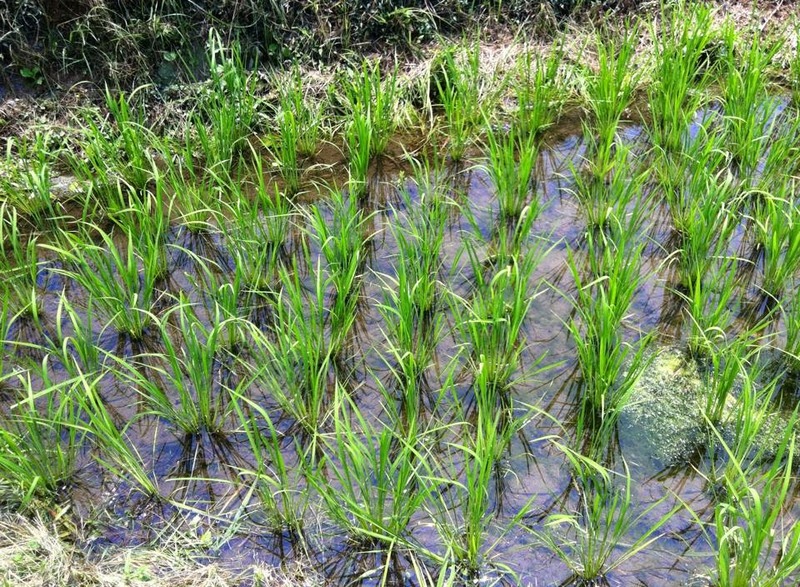 The rice field was located in Hirao, near Yanai. 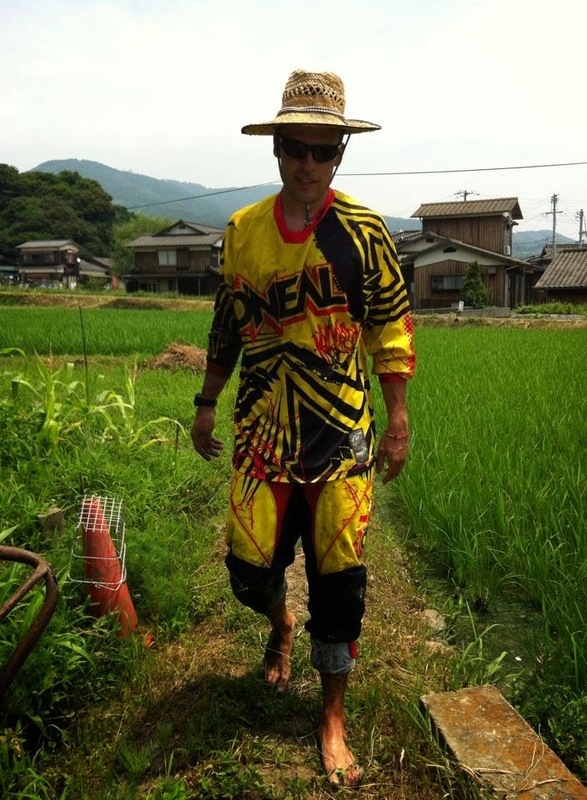 It was the rice field of Mike's kayak teacher, Koji Hara. It was very hot but also a lot of fun. The rice is still young so it was not very tall. In the picture, Mike decided to wear his motorcycle riding clothes so he could be protected from bugs. He said it helped prevent bug bites but it was very hot. 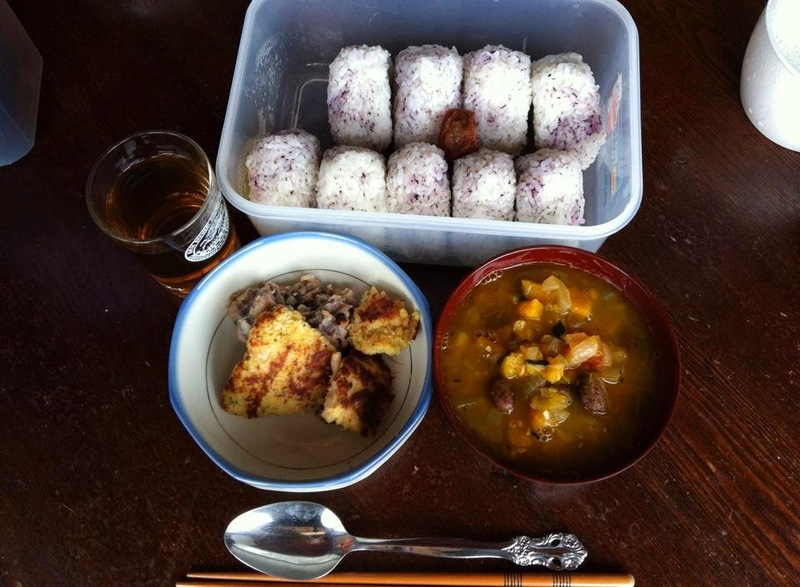 After two hours of picking weeds we had some great lunch with Koji's family. All the food was tasty and also very healthy. The Art of Making Sushi! Do you like sushi? Most people who come to Japan are big fans of it! In America, there are many Japanese restaurants that serve sushi - but as you might imagine, the menu is a little different than usual. Salmon and tuna are popular, of course, but octopus, squid, and sea urchin are hard to find. In Japan, I often go to sushi restaurants (my favorite is Kappa sushi!) and try many types. Recently, however, I wanted to try to make it myself! On the outside, sushi looks very simple and easy to make. But I've heard there is a secret art to preparing it, and that sushi chefs must train for many years before they are considered professionals. So I studied hard before attempting to make sushi, everything from the way to slice the fish to the recipe for perfect sushi rice. Then I made the rice in a rice cooker. I added sushi vinegar and a little sugar, and it smelled delicious! When it was time to make the sushi, I prepared a bowl of water with a little vinegar in it. I dipped my fingers in the water, and started to roll the rice in my right hand. To make the shape of the sushi, I pressed the sides and ends of the rice ball in my palm until it formed a rectangle with the sushi laying on top. Did you know that the trick to making delicious sushi is speed? If you hold the fish too long, the heat from your hand will warm up the fish, and it will spoil quickly. So after a few practice tries, I had to work fast! This is the final result! 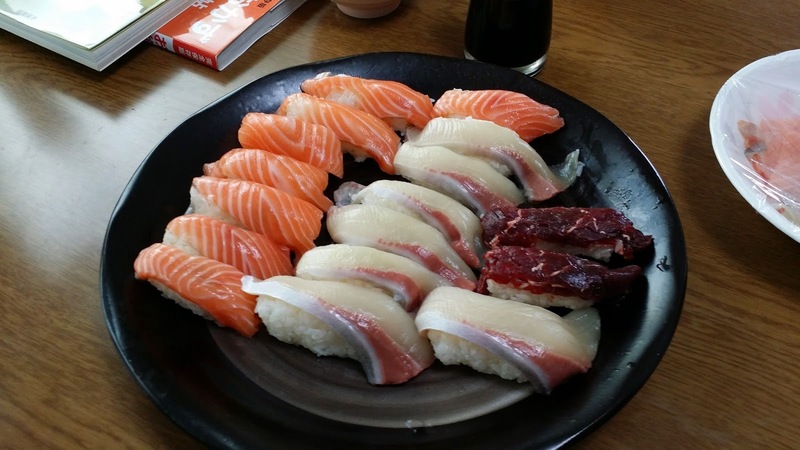 I made a lot of sushi for two people, and we even had some sashimi left over! It was SO delicious! 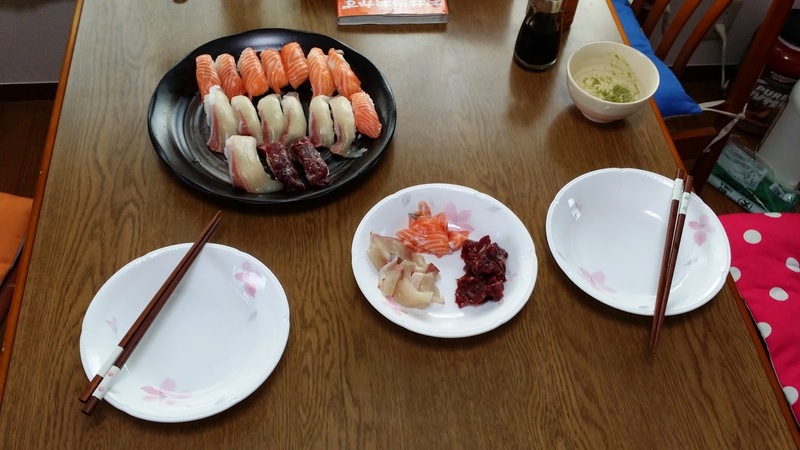 Can you recognize the three types of sushi? If you guessed salmon, yellowtail, and whale, you're correct! So, what do you think? Would you like to try some of the sushi I made? I'm sure you'll like it! Hooray for rainy season! It's such a nice time of the year. The weather is warm but not hot, and we often have a pleasant breeze. Evenings are cool and comfortable. All the rain nourishes the plants, so this is the most lush time of the year when the landscape overflows with a vibrant green. Sitting inside and watching or listening to the rain while reading a book or enjoying a cup of tea is pretty wonderful. Plus, after it rains, the kousa is cleared away and we have a sharp, vivid sky full of amazing clouds and clean, fresh air to breath. 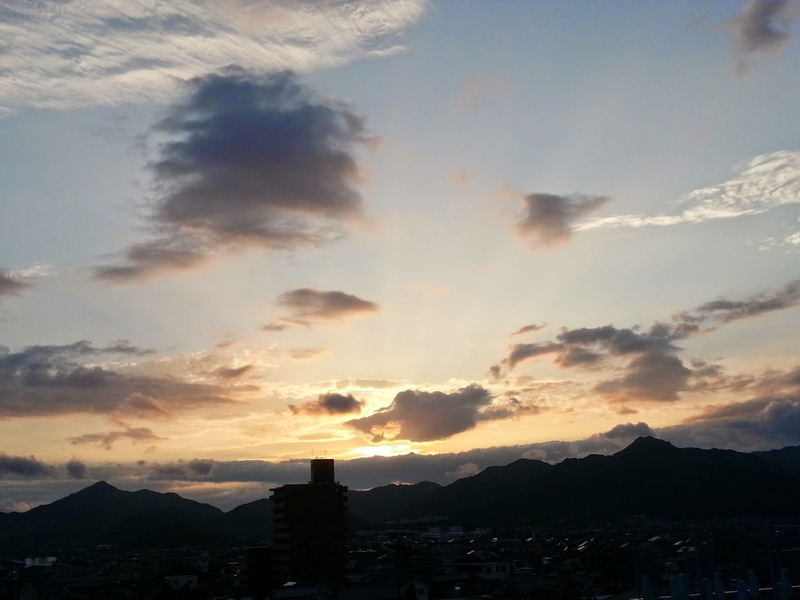 I live in Hofu, which is a really beautiful city. Here are a few photos I've taken with my phone over the the last few weeks since rainy season started. It is the world cup again and the world has been gripped with World Cup Fever! 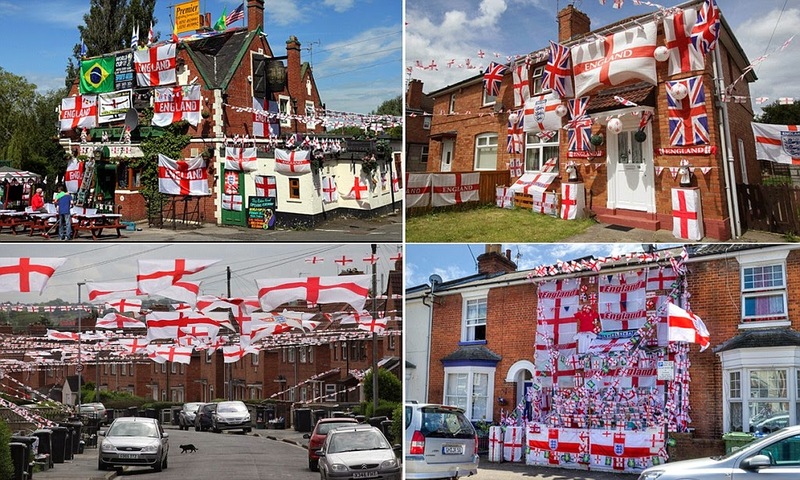 England loves the world cup. We watch it and get very excited. English people are very sensible and boring. We go to work early, work unpaid overtime and are famous for being unemotional BUT during the world cup we go crazy. Many people in England take paid vacations during the world cup so they can stay home to watch! 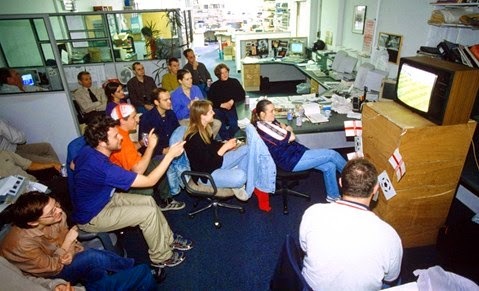 Offices in England set up television screens so we can watch the football as we work. We also decorate our streets and homes. The world cup is like Christmas! 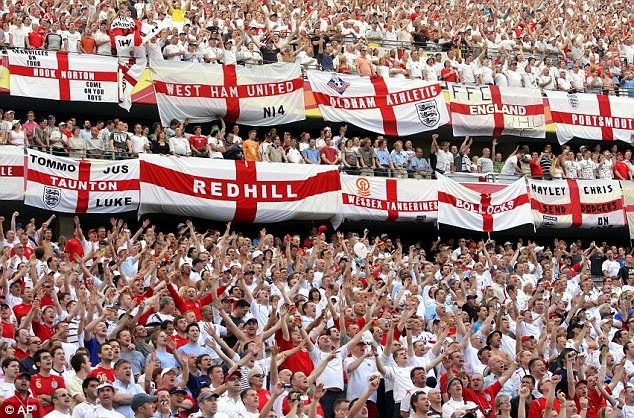 English people know that England will not win the world cup but we love to watch and see if we can beat Argentina! Its Mike. I was given a DVD of the Tsunoshima Trash KRY TV show and I would like to share it with you. I hope you enjoy. It's rainy season in Japan now. We don't have a rainy season in Virginia, but I've gotten used to it over the past few years. I like the rain more than I like the hot and humid summer that will follow. I wish there was more thunder and lightening though! As a child I loved watching lightening storms from my mom's car. What about you? What do you like to do on rainy days? Last week I went to three art museums. The museums had very different exhibits, and I loved them all. 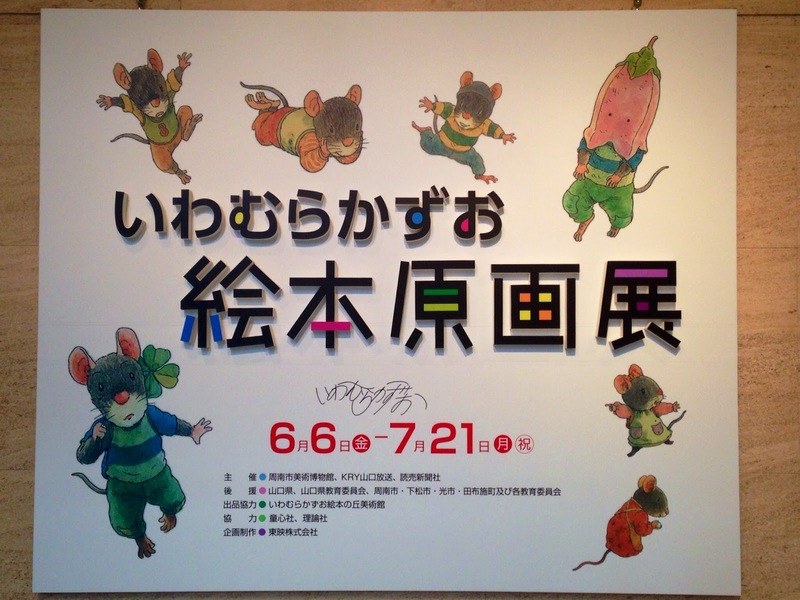 I visited the Shunan Art Museum to see the storybook drawings by the artist Kazuo Iwamura. I had never seen his drawings before, and they were very cute! They even had one of his storybooks on display that was translated in English. 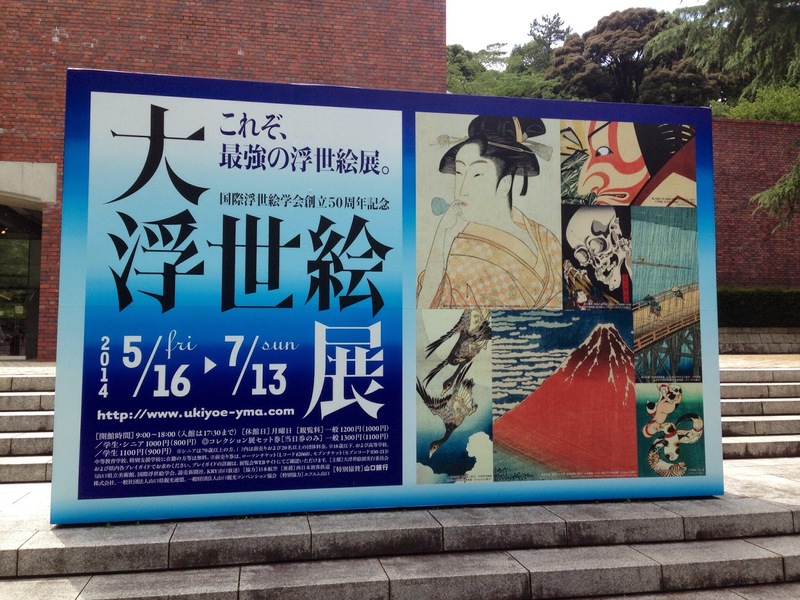 I also went to the Yamaguchi Prefectural Art Museum to see the wood block prints. There were some very beautiful pictures. I especially enjoyed the ones that featured Mt. Fuji. I went on a Thursday afternoon, and the museum was very crowded! I can't imagine what it's like on the weekend! Finally, I went to the Hiroshima Art Museum. I loved the artwork they had on display. 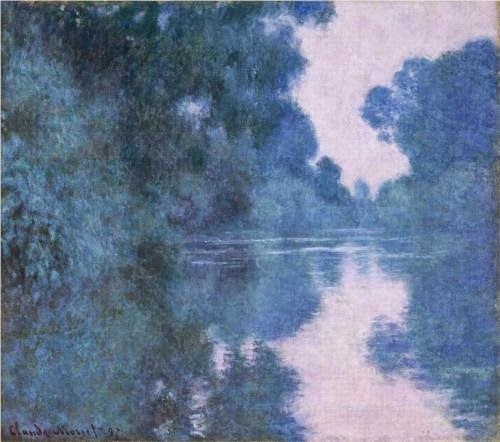 My favorite painting was "Morning on the Seine" by Claude Monet. The museum itself was beautiful, and it wasn't too big. Hi Everyone! I hope you're enjoying the rainy season! 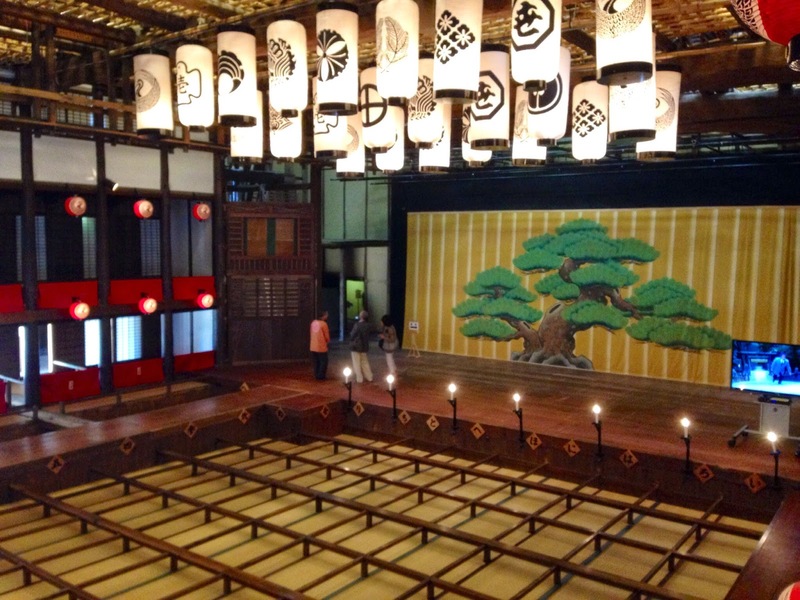 On June 14, I went to Hofu for an English tour of Ohirayama and Amidaji Temple. It was really fun and interesting! We took the ropeway up to the top of Ohirayama and enjoyed the nice view. Then we learned about some Japanese history. I didn't know that the logs used to rebuild Todaiji came from Yamaguchi! It was the first time I went to Ohirayama, but I want to go back, it was a lot of fun! Myself and the beach cleanup group that came to clean Tsunoshima beach on May 17th will be on KRY tomorrow June 3rd. The first time will be during the Sawayaka morning show from 5:20-6:00am and the second time will be during Scoop Up Yamaguchi from 6:15-7:00pm. If you have time please watch. Also, here is the Japanese translation of the show times. Before you read this please try to practice the English version above. I had a busy Golden Week vacation, but it was very fun as well! 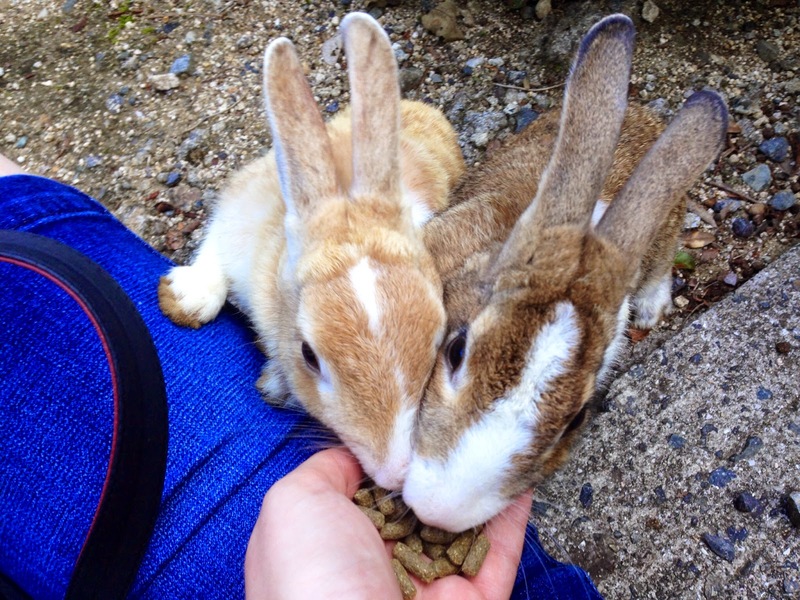 I spent the week driving around Shikoku. I drove through Ehime, Kagawa, and Tokushima prefecture. Some of the highlights of my trip were seeing Matsuyama Castle, a kabuki theater in Tokushima prefecture, and the whirlpools in Naruto. I hope you had a relaxing and fun vacation! Hello, everyone! did you enjoy your Golden Week vacation? During Golden Week, I stayed in Shunan. I usually like to travel somewhere during vacations, but I decided to stay home this year. I did go on one short trip to Akiyoshidai. I visited some friends and went hiking. It was cloudy, but the weather was still very comfortable. 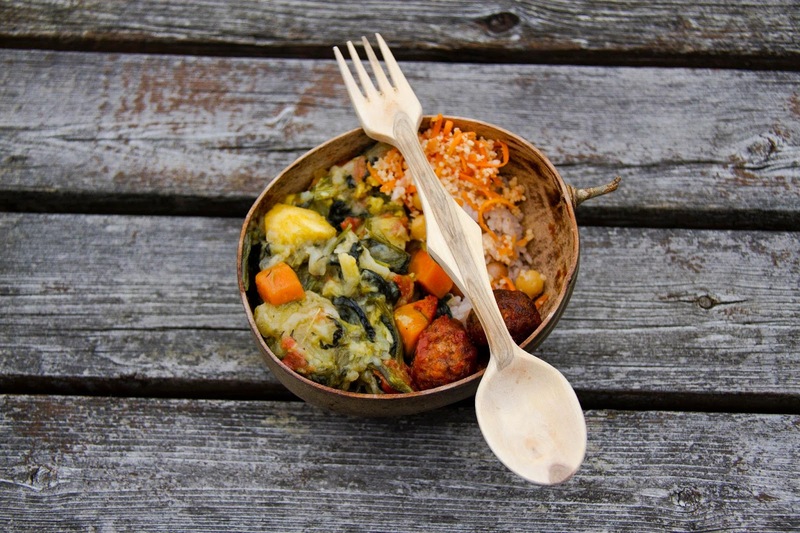 I also got to enjoy some delicious Jamaican food for lunch. It was vegan, so it didn't have any milk, eggs or meat. It was really good! What did you do for Golden Week?